This story starts way back, with Nels Larsen. 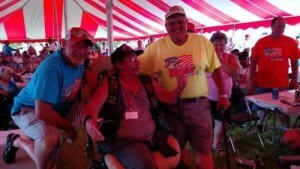 Larsen, an avid walleye fisherman debilitated by Agent Orange, was one of the first recipients that ever received an Action TrackChair from POAM. Also the founder of Walleyes for Warriors, Larsen wanted to give back and teamed up with POAM President Jim Tignanelli. 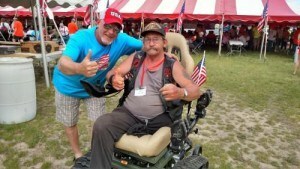 The two, along with donations raised by generous supporters, surprised John Ospalski with a new set of wheels at the Saginaw Bay Walleyes for Warriors event on June 20th, 2015. Veteran John Ospalski is missing his left leg. It’s difficult for him to enjoy the great outdoors like he always loved to as a young man growing up and do two of his all-time favorite activities: hunting and fishing. Completely surprised by the gift, Ospalski was overcome with emotion at the generosity shown to him. His new all-terrain wheelchair is equipped with a fishing rod holder, hunting rifle mount and all the necessary safety gadgets needed to accompany Ospalski while hunting and fishing.